A workplace that provides flexibility and practices that benefit working families not only makes for a better workplace, but it also increases productivity and reduces turnover, said President Obama at a recent White House Summit on Working Families in Washington, DC. The IAM took part in the day-long gathering of White House, labor, community and business leaders to discuss the issues plaguing many working families: low wages, unpaid sick leave, unpaid family leave, the lack of affordable childcare and the responsibility of caring for aging parents. The president pointed out that many workplaces have not kept up with the needs of 21st century workers and their families – a workforce where women make up nearly half of all workers and are increasingly the household breadwinners, though many of them are disproportionately working lower-wage jobs. When it comes to workplace flexibility, the U.S. trails other advanced countries like China, India and Brazil. The U.S. is also the only developed country that does not have mandatory paid parental leave. We can, says IAM International General Vice President Diane Babineaux. The solution to many of these problems plaguing women and working families in general she says, is unions. Research shows that both employees and employers benefit when workers are paid higher wages, receive benefits and are better trained. Costco pays its union employees about 40 percent more than its competitors. It’s employees, in turn, sell $986 per square foot, as compared to $588 per square foot at their largest competitor. Additionally, a survey of 253 employers affected by California’s paid leave program, which offers almost all private sector workers up to six weeks of paid leave, found that over 90 percent of employers reported either a positive effect on profitability, turnover, and morale or reported no noticeable impact at all. The president was joined by Vice President Joe Biden, his wife Jill and First Lady Michelle Obama. Other speakers included Department of Labor Secretary Thomas E. Perez, AFL-CIO Secretary-Treasurer Liz Shuler, Center for American Progress President Neera Tanden and House Democratic Leader Nancy Pelosi (D-CA). 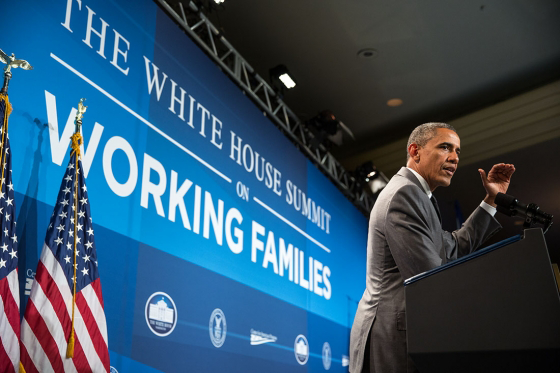 For more on the White House Summit on Working Families, visit www.workingfamiliessummit.org.